Who doesn’t love to save a little dough (even if it’s only a couple of dollars) on race registrations? I know I fall into that category time and again. I’m still kicking myself for missing the early registration deadline for Ironman 70.3 Racine—and as a result, have yet to actually sign up and cough up an extra $50 I could have saved myself if I had just remembered to visit the website before January 14. Maybe it’s just me, but once you miss out on one deadline for savings, you’re likely to do whatever you can to avoid missing the next one whether that means scouting out races that are less expensive to begin with, purchasing those awesome new Active Schwaggle deals or marking price increases on your calendar. If you’re contemplating a race-filled summer, you might want to spend Saturday registering for those events. Come Sunday, the joke’s on us when the fees jump for some of our favorite races. Soldier Field 10 Mile. Fleet Feet Sports puts on this Memorial Day Weekend opener and it never disappoints. Who can complain about a race that features a final mile, give or take, around Soldier Field’s underbelly, onto the warning track and finishing at the 50-yard line. And if you enter the code S12CHEERKB, you can save $5 off the entry. I’ll take that! Life Time Fitness Chicago Triathlon. This triathlon is one of the few that takes over a portion of Lake Shore Drive and the Lakefront Path on its August race day. It’s already had one price increase to usher in February and now there’s another approaching on April 1. Rock ‘n’ Roll Chicago Half Marathon. 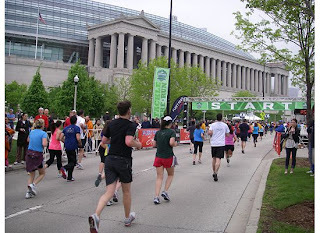 If you read yesterday’s post then you already know about the fees that are about to increase for the XSport Fitness Rock ‘n’ Roll Chicago Half Marathon. It’s far easier, at least in my book, to justify spending $85 (plus registration admin fees) to run 13.1 miles through Chicago than $100 or $120. Plus it’ll feel like a discount when you attend the post-race concert, known for producing A-list entertainment, considering many concerts cost the same and you’re not running a half marathon, too. Do you know of other races that have price increases on April 1? Ready to rock—and run—a Chicago Half Marathon?